I have put together a super gift list for your 7 year old boy! Between 2 moms and 3 boys of our own, along with a constant whirlwind of boys flying through my house as neighbors and friends come to play, this list of gift ideas is packed with things that keep them happy, entertained and having TONS of fun! For Christmas gifts or birthday presents, big or small, thrilling or calming, I’ve got some of the BEST gift ideas to share with you for your 7 year old boy! Seven year old boys are so much fun! They are creative and imaginative. They have hopes and giant dreams. They are becoming stronger and more coordinated. And they sure do love their mommas! 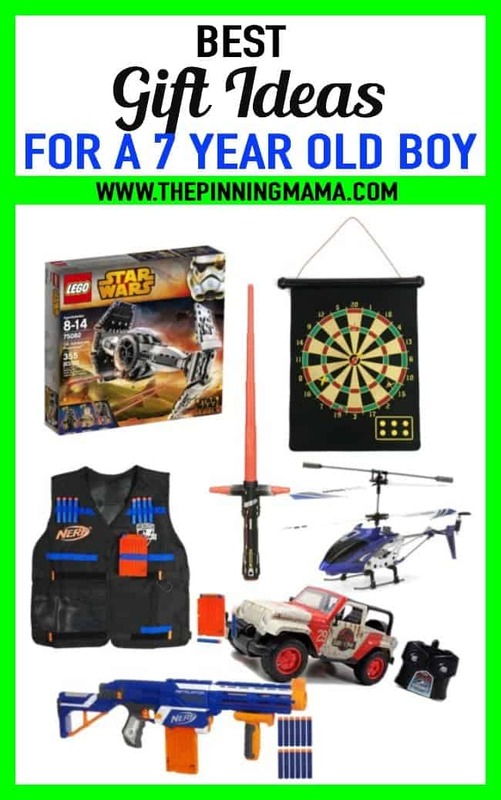 We have worked hard to gather some great ideas for the seven year old boy in your life! These gifts are perfect for both Christmas and birthday gifts! We have a wide variety of options to help you out: from big to small, both cost-efficient and splurges for a big gift, and energy-burning to restful focus. We hope you’re the hero the next time you want to give a present to the seven year old boy in your life! All boys- no matter their age- love to play! Here are some of our favorite gift ideas for the little boy in your life! 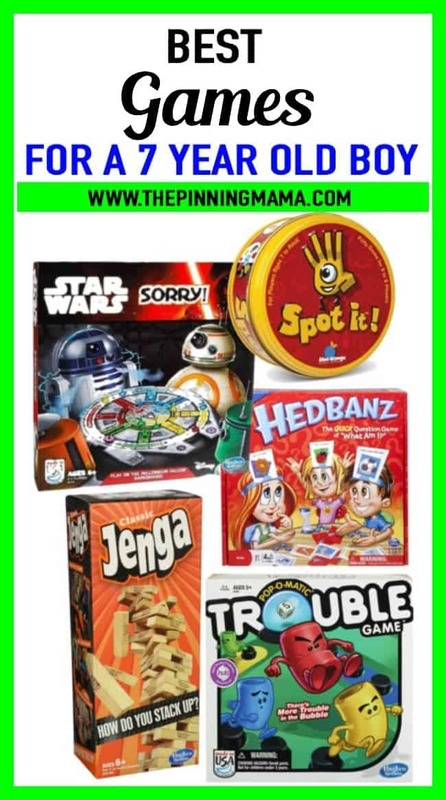 Magnetic Dart Board and Bullseye Game – I love that this is magnetic! It means no dangerous, sharp point at the tip of the dart. There is a small, flat magnet on the end of the dart that sticks to the board! The other perk: no holes in your wall! LEGO Star Wars TIE Fighter– LEGO kits are always a winner, especially when they are Star Wars themed! Star Wards Kylo Ren Extendable LightSaber– Let his imagination run free as he pretends to fight the Star Wars storm troopers! Remote Control Helicopter– This is a small and light-weight helicopter. It works both inside and out. Remote Control Jurassic World Jeep– This is an easy to maneuver remote control jeep! Perfect for those dinosaur-loving boys! Nerf Elite Rapidstrike Gun– This is like no other nerf gun! It is battery operated, so the benefit is no wait time to reload between shots. It is automatic and rapid fire! Having family Nerf fights has become one of our favorite family night activities! Nerf Elite Tactical Vest– A nerf gun battle simply isn’t complete without a tactical vest to hold your extra ammo! This is a great gift that is inexpensive but something they will love if they are into nerf! If my son could have it his way, he would live outside! He’s either riding his scooter, playing sports, or climbing our trees. If the house gets too quiet and he’s nowhere to be found, you can bet he’s outside somewhere! Here are some very fun gift ideas that any little boy would love to play with outside! Platform Swing– This swing is SO cool! It’s a very well made product that holds up to 250 pounds- – so, it’s perfect for friends to swing on together! Attach it to a sturdy tree branch or strong swing set bar and be amazed at how it glides in the air! Razor PowerWing Scooter– This is a fun trick scooter! The rear caster wheels propel the scooter by the child twisting his feet back and forth. It can even spin in a complete circle! And notice the brake on the handle bar! Razor Lighted Wheel Scooter– The razor scooter is always a winner! But it’s so much more fun when the wheels light up! 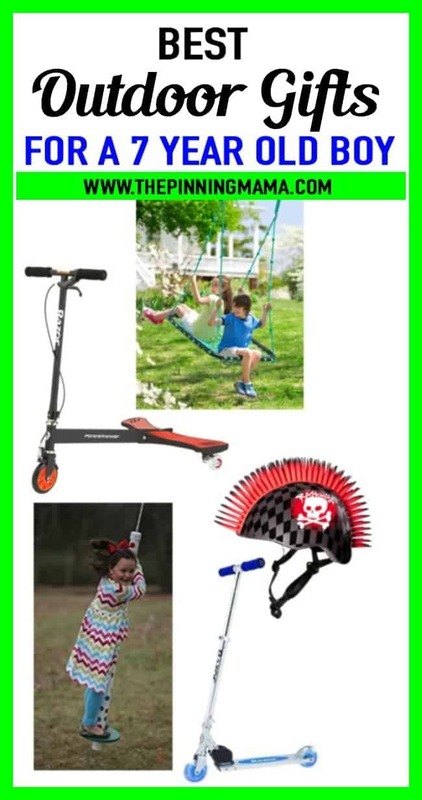 Raskullz Helmet– Helmets are always a good idea when your child is playing with any ride-on equipment. I would especially recommend it with the Razor PowerWing scooter! It cracks me up that my sweet and quiet son LOVES his mohawk helmet! It may not match his personality, but at least it protects his little head! Morf Board – This is a newer toy that has hit the market with a bang. The cool thing is that this board “Morfs” into a scooter, skateboard, bounce board, and more! It is currently Item #1 on my son’s Christmas list! I think boys, no matter their age, love to pretend they are some kind of hero! I’ve noticed in the last year though, that my little boy and his friends are beginning to move away from super hero dress up, and are beginning to pretend they are real-life heros. So, dressing up as soldiers, air force pilots, police officers, and stormtroopers (are they real life?) are what these boys tend to do more often. Friday night is always game night in our home! Here are some great game ideas for that work well with little boys. SORRY! Star Wars Edition– SORRY! is one of those classic games that continues to be played! Playing the Star Wars edition only makes it better! Spot It!– This is a speed game of visual perception. Put any two cards together and there will always be one picture on the two cards that matches. Be the first to find it! There are 5 different variations of this game, so it never gets boring! Hedbanz– The game where you have to guess what you are by only asking yes or no questions. This game is so fun and kids would never guess this game will help their critical thinking skills! Education for the win! Jenga– A winner every time the boys are together! Trouble– Another classic game that never gets old! Most little boys loves sports! Any sport! This is a fun age because they are beginning to understand the concepts and plays in the games. For example, soccer is no longer a mass of 7 little boys running around the soccer field together, but is a game where they are beginning to play their positions! And in baseball, they are beginning to be able to aim their batting swings and actually catch a pop fly! Here are some fun sports gift ideas that will help any little boy improve their skills at home, while still having fun! 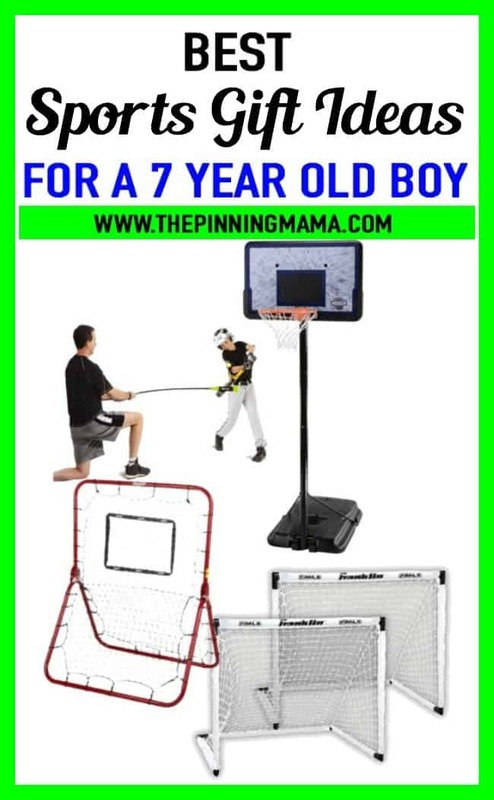 Baseball Target Swing Trainer– This may just look like a stick with a ball at the end, but it’s a very effective skill trainer for your budding baseball player. It’s effective for drills to increase batting accuracy, speed and strength. Baseball Pitchback Rebound Net– My son LOVES to practice his baseball catching using this net! Depending on where he throws the ball to hit on the net, it will rebound back as either a grounder or a pop fly, so he’s able to practice so many different catching skills with it! Also, if mom or dad don’t have time at the moment to throw the ball in the backyard, any boy can do this on their own! Portable Basketball Net– Adjustable height makes this great for any age boy to practice his hoops skills! Soccer Goals– These soccer goals come in a set of two! They are perfect for a family game of soccer in the backyard! You can also get pricier rebound soccer goals if he mostly practices alone. I feel like 7 years is the age where little boys are beginning to find those early chapter books that capture their attention for more than 5 minutes. But, they also still love to sit with an adult who will read an exciting story to them! Here are some great book suggestions for your budding reader! Illustrated Stories for Children– I love both of these illustrated story books that we have suggested here! They include famous adventure-filled stories and have great pictures to go along with them! After every story I read, my son ALWAYS asks, “One more, please? !” How do you say “no” to that?! Magic Treehouse– So many adventure stories in these books! Hank the Cow Dog– We have spent many mom and son evenings, snuggled in his bed, reading and laughing at Hank the cow dog. Big Book of Why– This is a GREAT book! It is filled with so many fascinating facts that kids are interested in. Why does my cat purr? Why can’t penguins fly? Why is a basketball orange? Honestly, these random facts are just as intriguing to me! Here are our final favorite gift ideas to help you as you search for the perfect gift for the 7 year old little boy in your life! Batman Time Teacher Watch– I love this watch for two reasons! One, it’s Batman-themed! What could be cooler? And two, it helps them learn to tell time! Timex Camouflage Digital Watch– Camouflage is always a winner! So is Timex! This watch is a great combo! Hamper Hoops– My son begged for this everyday for THREE MONTHS leading up to his birthday. Seriously?!?! But, he loves it! I can’t complain- – his dirty clothes have stayed off his bedroom floor! Star Wars Peel and Stick Wall Decals– This set comes with 31 removable decals. What a fun way to let your little boy’s imagination and adventures be a part of his bedroom! I hope this list of gift ideas will help you as you search for the perfect gift for the 7 year old boy in your life! But remember, some of the best gifts can’t be bought! Playing games together, reading together, throwing the ball in the backyard together, imagining adventures together- – these are the true gifts! As you well know, time goes so fast! Enjoy your little boy while he is still little! Enjoy his imagination, his creativity, his aspirations! Build him up and affirm him as he grows and explores!